Luxurious cervical neck support pillow features removable foam inserts, giving you as many as 12 adjustment options so you can create the pillow to suit your comfort needs. Designed to encourage side sleeping. Temperature-sensitive visco elastic memory foam ‘feeling is believing’ . Visco memory foam responds to your body’s warmth and moulds and shapes to your head and neck giving your spine support. Encourages the natural alignment of your spine by providing even support. Super-soft cervical neck support pillow. Comes in a ‘breathing’ open weave cover. Complete Sleeprrr… the totally adjustable memory foam contour neck pillow that is designed to help reduce snoring through side sleeping. Therapeutically contoured and designed by health professionals to give you the perfect neck support & alignment a memory foam pillow can offer. Two easily removable/re-workable inserts allow you to change the shape and height to suit your comfort and postural needs. Takes the risk out of your pillow being too high, too low, too hard or too soft. It’s all so simple. One size suits all! Features ‘higher’ and ‘lower’ sides as well as contour variance for maximum individual support and comfort for side or back sleeping. Pillow’s clever design encourages side sleeping which is beneficial in enhancing breathing, and minimizing snoring. Scalloped under-edges allow shoulder (when side sleeping) to slip snugly under pillow for close-knit fit. Head and neck are cushioned and supported during sleep. Designed to help alleviate and avoid neck and shoulder stress and muscle stiffness. Foam ‘noodles’ in corefoam surface can be removed to make for an even softer. 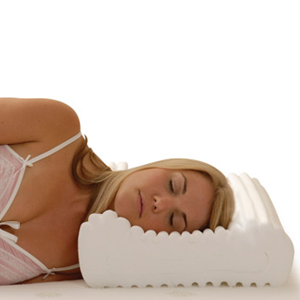 Pillow’s contour may help stop snoring by enhancing the airway through encouraging better spinal alignment. Channels in corefoam surface, combined with the open-weave inner cover, allow air to circulate, for cooler, healthier sleep. Recommended by the Chiropractic physiotherapy, osteopathic profession. Totally adjustable cervical pillow – A revolution in pillow concept and design. Align your spine with this supportive cervical pillow. Carved from premium grade memory foam and valued for its superb comfort and support qualities for people of all physiques. Using open-cellular technology, it is widely known for its product longevity and economical price. Regarded by many health professionals as an ideal ‘marriage’ between comfort and support.